Click for answer 1) What insurance companies do you use? Pamela Yellen is an educator, not a licensed financial advisor, which means she’s prohibited from recommending or naming any specific companies that have policies with all the features needed to maximize the power of the Bank On Yourself concept. And knowing the names of the companies isn’t enough. Equally important is that your policy be designed properly; otherwise your plan could grow much more slowly, lose the tax advantages, or both. It’s the job of the Bank On Yourself Authorized Advisors to look at your overall financial picture in order to design a customized policy that will help you reach your goals… and then recommend the company that’s most suitable for your situation. When you request a free, no-obligation Analysis, you’ll get a referral to one of only 200 financial advisors in the U.S. and Canada who have met the rigorous training and requirements to be an Authorized Advisor. The Advisor selected for you will be happy to provide you whatever data and information you’d like about the insurance company selected for your plan, so you can do your due diligence and satisfy yourself that the company is financially sound. Bank On Yourself Authorized Advisors only use insurance companies that are among the top companies in terms of financial strength, and which have a track record of paying dividends every single year for at least the past 100 years. Click for answer 2) Can you give me a list of all the advisors in my area? We’ve asked the Bank On Yourself Authorized Advisors if they would be open to being interviewed by prospective clients who wish to speak with several advisors before determining which one to work with. They have said they would prefer to invest their time with their clients, helping them design and implement their plans effectively. Click for answer 3) How safe is my money in a Bank On Yourself policy? Learn about the five-layer safety net that protects policy owners. You can also find out what life insurance companies invest in to be able to deliver on their promises to policy owners. Click for answer 4) I’m interested in seeing some numbers showing how this plan would look for my given situation and circumstances. There are many variables that are taken into consideration, such as your age, health, income, when you plan to retire and what your short-term and long-term goals and dreams are. No two plans are alike – yours would be custom tailored to fit your unique situation. To find out what your bottom-line numbers and results would be if you added Bank On Yourself to your financial plan, simply request your free, no-obligation Analysis. When you do, you’ll also receive a referral to one of only 200 financial advisors in the U.S. and Canada who have met the rigorous training and requirements to be a Bank On Yourself Authorized Advisor, who will prepare your personalized Analysis and Solution. There is no cost or obligation for this Analysis, so you really have nothing to lose and everything to gain! It’s not too late to rescue your financial plan, but don’t put it off another day! Click for answer 5) Can I use my 401(k) or IRA to fund a Bank On Yourself to start a plan? Learn more about rolling over a 401(k) or IRA, depending on whether you’ve turned 59-1/2 yet here. Click for answer 6) What effect will the economy have on my policy? 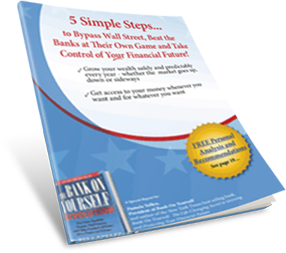 Learn how the Bank On Yourself method will hold up under various economic scenarios. And here’s some insight into what would happen with the Bank On Yourself Strategy if the U.S. economy goes into a tailspin. Click for answer 7) How much does it cost? There is no cost for a Bank On Yourself Analysis that will show you all the bottom-line results you will get from Bank On Yourself. Should you then choose to start a Bank On Yourself-type policy, the Bank On Yourself Authorized Advisors do not charge fees to design and implement your plan. They receive a commission from the insurance company, which has already been taken into account in the bottom-line numbers you’ll see. Much like buying a TV or a couch, the costs of manufacturing and sales are already included in the price, or in the premium, in the case of a Bank On Yourself Plan. Also, the commissions on these policies are 50-70% less than they would be if your policy were designed the traditional way. However, Bank On Yourself is NOT a one-size-fits-all plan. There’s no pre-set amount a person would put into a plan, because the plan would be customized to YOUR unique situation, goals and dreams. Take advantage of a no-obligation Bank On Yourself Analysis to find out what your bottom-line numbers would be. Click for answer 8) Can I take a policy loan right away? We answer this question and other related questions in our Consumers’ Guide to Policy Loans. Click for answer 9) I live outside the U.S. – does Bank On Yourself work here? At this time there are no Bank On Yourself Authorized Advisors outside of the United States and Canada. If you’re from anywhere else in the world, unfortunately we aren’t familiar with the insurance products available there or with the tax laws. We would recommend you take the book (available outside the U.S. through Amazon.com) to your local insurance advisor so they can look into it for you. Sorry, but we do not reply to email received from outside of the United States and Canada. Click for answer 10) I want more information. If you don’t already have our FREE Special Report containing all the details of what Bank On Yourself is, you can download it free here. The New York Times best-selling book on this topic, The Bank on Yourself Revolution: Fire Your Banker, Bypass Wall Street, and Take Control of Your Own Financial Future, is available at a 38% discount here. Click for answer 11) How do I get started with Bank On Yourself, or how can I receive my FREE no-obligation Analysis that will show me how this could help me reach as many of my goals and dreams as possible? The first step is to request your FREE Analysis here. When we receive your completed form, we’ll send you an email (usually within one or two business days) containing the name and contact information of the Bank On Yourself Authorized Advisor selected to provide your free Analysis.